Townsmen will see release on the Switch in Japan on Jan. 24th, 2019. Giebelstadt, Germany, October 24th: Are you eager to build the town of your dreams? To organize production chains, take care of the needs of your population and grow a small village into a large and prospering city? Then your wait will come to an end on November 9th, 2018, when HandyGames will publish Townsmen – the first medieveal city builder ever on Nintendo Switch – and let you build a town on your journey into town (or, indeed, anywhere). 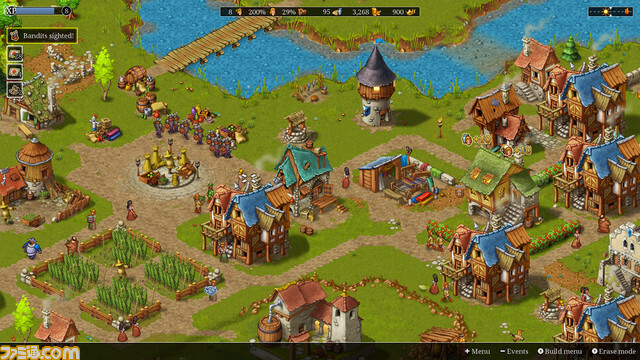 Townsmen will be available for Nintendo Switch on November 9th 2018 for an SRP of 19,99 € / 19,99 $. The game is developed and published by HandyGames. Develop your tiny village to a grand medieval empire with a thriving economy and happy villagers! Find spots for mining ore, harvest the crops of your farms and collect coins as taxes from your folk. Build jousting fields, taverns, marketplaces and beautify your city with impressive statues, magnificent monuments and lush gardens. But there are also dangers lurking close by. Bandits are in the area, looking to plunder and pillage your peaceful town. 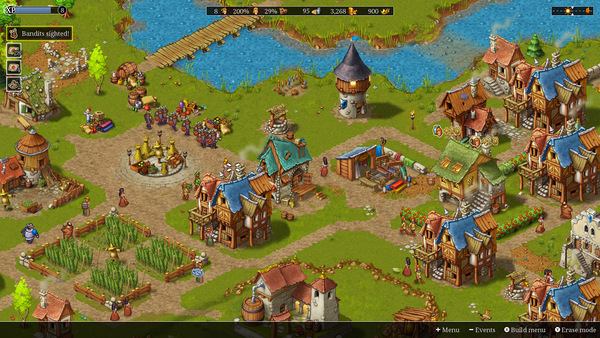 Build barracks, guard towers and recruit brave soldiers to protect your citizens from harm. You rule the whole empire from your castle and make sure your inhabitants have fun and stay happy! Everyone’s favorite fluffy flock is back – and it’s livelier than ever! In this eagerly anticipated sequel of the game Clouds And Sheep, the cute sheep are finally on the loose again! Solve countless quests and fulfill your wooly friends’ needs. Plant grass, flowers, trees and shear your animals’ different-colored wool to stock up your resources! Collect happy stars, harvest wood and flower petals and use them to provide your flock with food, accessories, toys and more! Control the clouds and make it rain to ensure your sheep never run out of fresh water to drink. If your sheep feel happy and content, they’ll bring tiny lambs into the world! WARNING! All fish in this game are trained stunt fish! Do not attempt to re-create or perform the same or similar stunts at home …your goldfish will not enjoy it! ‘Dynamite Fishing – World Games’ follows the tradition of its successful predecessor Super Dynamite Fishing and offers players the craziest fishing action full of fun. Hunt and hook a boat load of different fish, from bass to shark, and send them flying to the beach with a big BOOM! You’ll make them wish for a peaceful life in a fish tank. Collect coins to increase your top selection of crazy explosive weapons to knock out the sea dwellers the epic way. It’s you vs them, so don’t hesitate to throw TNT, nuclear missiles or other surprise ammunition into the water. The fight against the scaly creatures is on! Let’s show them who rules the ocean!